They are climbing the Lemosho route, which is the most scenic route and also the one that gives them the best opportunity to acclimate to the altitude which gives them a greater chance of success. I was informed this morning that Steve (their guide and George’s father) decided that they will do the entire Lemosho route and not diverge to do the Western Breach because Shayna’s arm length would make it very difficult for her to do the bouldering required for the Western Breach. Lemosho is a fairly demanding route, due to both the nature of the terrain and the duration of the trail. The trail begins on the western side of the mountain. Lemosho is a narrow wilderness trail right from the beginning, passing through pristine and remote rainforest with good chances of seeing wildlife. Lemosho sees a very low number of people. The starting point for the Lemosho Route is the Londorossi Gate. In the morning, they will drive 2 hours from Arusha to the Londorosi Entrance Gate where they will register with the park rangers. They expect to spend more time driving and waiting around at the gate than walking. They hope to see some wildlife on the first days. 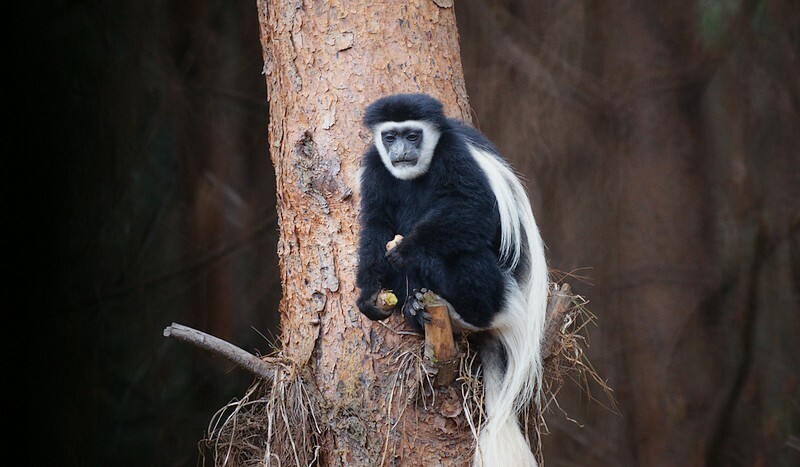 In fact, a troop of the beautiful black and white Colobus monkeys like the one in the photo above have taken up residence in the trees right next to the park ranger quarters. After the registration at the gate they will return the way they came, about ten minutes through some fields and cypress plantations, to get to the trail head. Some call it Londorossi, some Lemosho Glades, some Simba. They will follow the muddy road for another 20 minutes until they finally get to the real trail head. Their trek begins in dense, misty rainforest. The forest is beautiful, like out of a fairy tale. It is full of smaller wildlife, Colobus and Blue monkeys being the most conspicuous. In the early days, shortly after the route was established, you had to be accompanied by an armed ranger here because of the water buffaloes. Today, the much larger number of climbers means bigger animals are rarely seen. This very first day on the Lemosho Route has several steep sections to get the pump pumping, but it will only takes two to three hours for them to reach their fist campsite, the Big Tree Camp or Mti Mkubwa. It’s a lovely camp, located, as the name says, under a big tree and with plenty of monkeys and birds around. Even if they don’t see them, they should hear them in the evenings and mornings. Many years ago, Howard and I decided that we wanted to raise our children to be global citizens with an appreciation of each other’s cultures. By forming personal relationships with people outside their lived world, they can build bridges to a greater understanding of the world. To this end, today they have friends all over the world from many cultures representing different races, religions, and ways of viewing the world. We also felt that it was necessary to require them to have a purpose: a goal to strive toward where they have to learn how to persevere, to deal with disappointment and setbacks and to live a life where the concept of “Tikkun Olam” (Jewish concept of charity) was embedded into their daily lives. The Kilimanjaro climbs have accomplished just that, multiple times over. To date, they have not all successfully reached Uhuru Point (the summit). Only Ben and George did that the last time. Both Howard and Max had serious health issues on the mountain that required them to return to lower altitudes before reaching the summit. They have continued to regroup after each climb and continue training. Their training hikes kept them talking to each other and maintaining open and close relationships with us during their teen years. They have bonded uniquely with each other and George. They have impacted George’s life dramatically as we are trying to help him come to the USA for college. Shayna has never known a time when they haven’t been training and was determined to do it too. This third trip (probably Howard’s last) is her turn to go. These trips have become the topic of both boys’ college application essays. It is a hard physical challenge but it has shaped each of them in immeasurable ways which are not quantifiable but can be seen in each of their personalities. It is very possible that they would be different people today if they hadn’t focused on these climbs for the past 9 years. They are also trying to finish raising money for the Magen David Adom ambulance. This has had a life of its own and they are only halfway there. However, they’re not quitters. I am sure that eventually they will pay for the ambulance. This connects the climbs to a greater good which they are very passionate about and that is Israel. So the climb has meaning beyond just them. Which brings this to me: the non-climber in the family. Well, for the first time in 25 years, I am on my own at home, discovering who I am when I’m not defined as a wife or mother…I’m climbing my own mountain.